In case you’ve missed it, Can You Pet the Dog is one of the most important Twitter accounts going at the moment. Not only is it cataloguing all of the games in which you can (or cannot) lavish affection on your furry friends, but it’s also encouraging some developers to rectify their previous mistakes. Which is why you can now officially pet the dog in Fortnite. 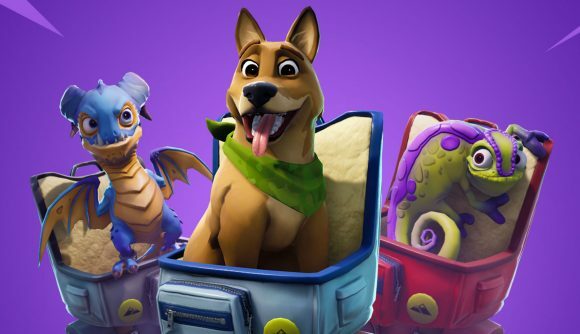 Pets were introduced to the game as an alternative to Back Bling at the beginning of Season 6, allowing you to stride into battle with a chameleon, a dragon, or a dog on your back. For a while, they couldn’t do much more than look around excitedly (or growl when you scoped in on an enemy), but all that changes today. As of patch 8.4.0, approaching a teammate who has a pet equipped now offers a button prompt giving you the option to “pet” the animal in front of you. As you can see in the tweet embedded below, it’s a slightly crude animation, a bit more of a slap than a stroke, but hey, it’s a start. The Twitter account only began last month, but has already gathered 175,000 followers to its cause. So far, it’s catalogued petting from games ranging from Far Cry Primal to Minecraft. This isn’t the first time that a rating from Can You Pet the Dog has encouraged a speedy update. Earlier this month, the developers of Enter the Gungeon added a custom petting animation to their game after the account pointed out that you were unable to provide adequate affection to your four-legged friends.